Posted in: Journal Club. Tagged: exoplanets. Figure from Mocquet et al. 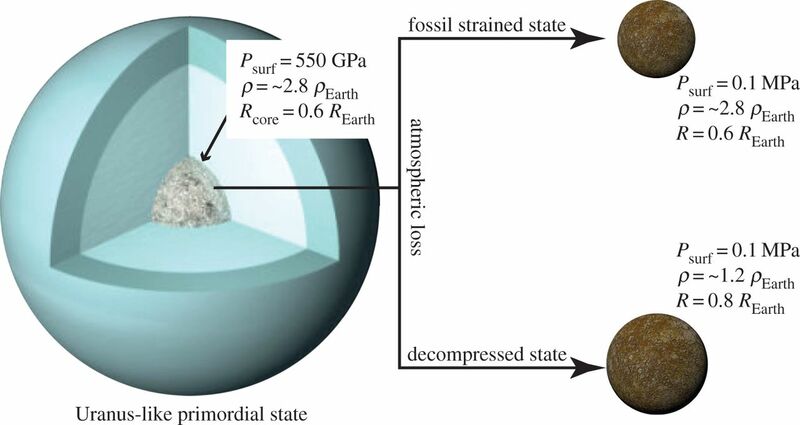 (2014) show how a gaseous planet might evolve into a dense, rocky core. Another blast from the past, Mocquet et al. (2014) was the topic of our journal club this week, a paper that seeks to answer the question “What would Jupiter look like if you took away its atmosphere?”. Given the enormous number of gas-rich exoplanets very close to their host stars discovered in recent years, many astronomers (including myself) have wondered whether such planets could have their atmospheres completely removed. 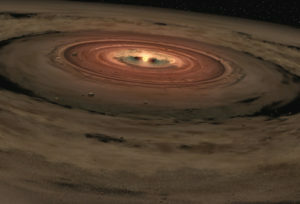 We certainly see some very hot planets where intense sunlight is blasting away their atmospheres, and in other cases, the star’s gravity can rip off the atmosphere. 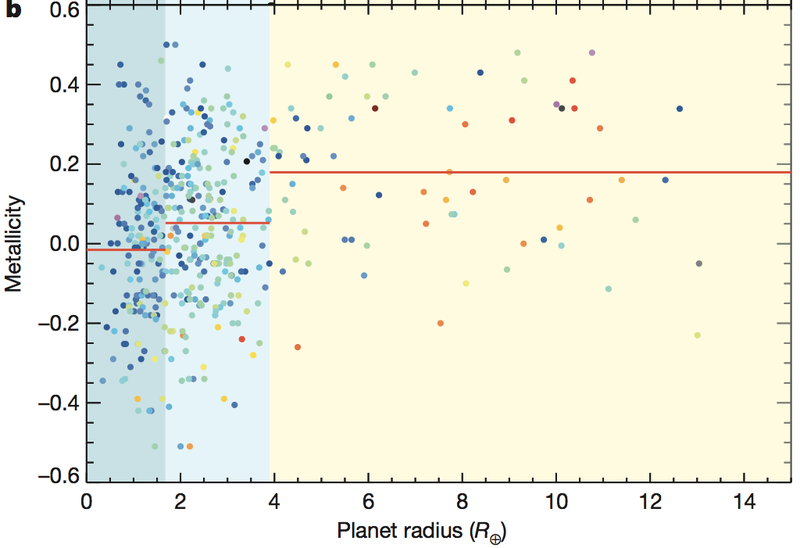 And so it’s not crazy to think some gaseous planets might completely lose their atmospheres. Would anything be left over? Astronomers think that gas giants like Jupiter are like big cherries, with a squishy outer layer of gas wrapped around a dense pit of rock. Indeed, the Juno mission currently in orbit around Jupiter is designed to measure the size of Jupiter’s core by measuring its gravitational field very precisely. And so the cores of gas giants are under enormous pressure – for instance, the core of Jupiter is being squeezed by 45,000 times the pressure at the bottom of the Mariana Trench on Earth. In their study, Mocquet and colleagues explore what happens to a rocky core under such large pressures. Not surprisingly, they find that such a core would have an enormous density, perhaps three times larger than the Earth’s. But what is surprisingly is that their results suggest the core might retain a very large density even if you removed the overlying atmosphere. It’s as if you squeezed down a nerf ball and then let it go – instead of springing back immediately, the nerf ball would take a few billion years to decompress. This means that we might be able to identify the cores of former gas giants by looking for planets roughly the size of Earth but with anomalously high densities. And in fact, such planets have been found – the planet Kepler-57 b has a mass more than 100 times Earth’s but squeezed into a volume only ten times larger, giving a density of almost 44 grams per cubic centimeter – twice the density of the densest element on Earth, osmium. So in their search for fossils, gas giant paleontologists should keep in mind that the bones of extinct gas giants may have distinctively large densities, almost as dense as adamantium. Just returned from my trip to Idaho Falls, speaking to hundreds of locals about the upcoming eclipse. I was invited to give two presentations at the Idaho Falls Public Library, a library so beautiful and spacious it has an atrium with a fountain. 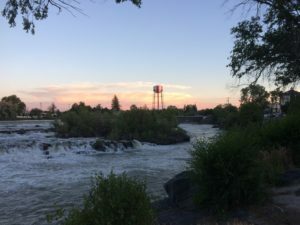 On Tuesday evening, I gave a presentation to the broader Idaho Falls community. A few minutes before the presentation, there were only about a dozen attendees, which made me a little nervous, but by the appointed hour, the space had filled beyond capacity, with nearly one hundred folks – an unexpected large but very welcome crowd. Before my next presentation on Wednesday afternoon, I took a side trip up to the St. Anthony dune field. Since the dune field is likely to be a prime spot for eclipse-viewing, I was curious to see what preparations they were making. The dune field near St. Anthony. Back to Idaho Falls for an afternoon presentation geared to the youngest eclipse enthusiasts. Here again, we had an unexpectedly large crowd, with easily 200 kids and parents cheerfully crammed into the presentation space. After helping the kids make souvenir planispheres, I packed up my roadshow for the long drive back to Boise. The megaflood-carved landscape of the Snake River Plain combined with a Planet Money podcast about a flatware-crafting commune to make the time pass quickly. The presentations I gave in Idaho Falls are posted below. Visited with students at the STEMBus Summer Camp hosted at Bishop Kelly High School. Lots of enthusiasm and good questions from the students. The presentation I gave is below. UPDATE: The stargazing event today went swimmingly – several dozen visitors came down to talk about the solar eclipse and look at the Sun. We even had crew from KTVB film some interviews. Some photos from our event below. Little spot visible on the Sun. Small crowd at the beginning of our event. 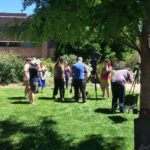 Join the Boise State Physics Department and learn more about the Aug 21 solar eclipse. 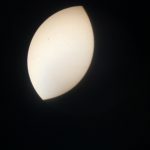 We will host a conversation about observing the eclipse and distribute eclipse shades. 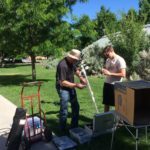 The event will take place on Sunday, June 18 from 12p till 2p in the plaza just north of the Multipurpose Classroom Building on Boise State’s campus. Questions can be sent to Prof. Brian Jackson via e-mail – bjackson@boisestate.edu. Posted in: Public Outreach. Tagged: dps 2017. Asking questions at a scientific conference is one of the most exciting but intimidating aspects of conference attendance. Here, I give a few suggestions (write down your questions, introduce yourself, etc.) to ease the process. Annual scientific conferences are one of the highlights of working in astronomy – you get to visit a new place, you get to meet with old friends, and you get to hear about scientific results so cutting-edge they can change from hour to hour. Optimizing the conference experience requires a fair amount of planning, but fortunately, there are a number of online guides explaining how to plan your conference, how to prepare an oral presentation, how to make a poster, etc. At the end of most presentations, the audience is invited to ask questions, and these question-and-answer sessions can lead to some of the most exciting, interesting, and dramatic developments at a conference. These exchanges can also be very important forums for feedback and can give a budding scientist a chance to make connections to the broader community. So I thought it would be helpful to collect a few thoughts on the topic. These ideas are by no means exhaustive and may not be widely agreed upon, so if anyone has suggestions, please don’t hesitate to let me know. 1. Don’t feel bad for feeling nervous – One of my colleagues once told me she felt so nervous walking up to the mic to ask questions that she thought her voice would crack. That made me feel a lot better about my own intestinal lepidoptera. Most people get anxious when speaking in front of hundreds of the smartest people in the world, so don’t stress about feeling that way. If you anticipate wanting to ask a question, though, you can sit close to the mic at the beginning of the presentation to shorten the walk. 2. Write down your question – I tend to take short notes during presentations, usually about things to ask the speaker after the presentation or even in an e-mail after the conference. But it’s very helpful to already know what you want to say before getting to the mic, so not a bad idea to write it down. 3. Introduce yourself – Several times after one of my presentations, someone has asked an interesting question or made a good point that I wanted to follow up on afterward. However, after asking their question, the person melted back into the crowd to remain anonymous forever. So it’s very helpful if you give your name and affiliation before asking your question. Keep in mind that the speaker may be staring into bright lights and not able to see the audience. I also think it’s just common courtesy to introduce yourself, and if, as a community, we encourage questioners not to remain anonymous, we will reduce the temptation to attack the speaker. If you have a lot to say or would like to address a very narrow, technical point in the presentation, it’s probably best to wait until after the session to talk to the speaker. Remember that the presenter is not the only person to whom you are speaking. I think it’s best to focus on questions of general interest, not just to the one or two people who specialize in, for instance, tidal dissipation parameters. Of course, this is a scientific conference where the audience is full of specialists, so there’s a balance to strike here. Also, at most conferences, there are only a few minutes for questions, so keeping your question short leaves time for others. The point of the story is not to complain but to say that it’s not helpful to attack a speaker publicly since it can be hard for someone to come up with a thoughtful response on the spot. I think it’s much more effective (and more polite) to raise such concerns privately (at least at first), perhaps one-on-one or via e-mail. Then, if the presenter refuses to respond or obfuscates, maybe it makes sense to raise your concerns in a public forum so the community is aware of the problem. 6. When in doubt, save it for the post-session – In the end, you almost always have a chance to talk with the speaker later. 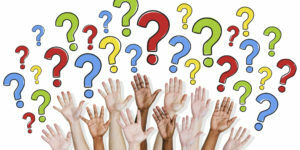 So if you’re hesitant to ask during the question session, approach the speaker afterward. It’s true that there are some jerks in the scientific community, but the vast majority of scientists I’ve met are considerate and thoughtful. And even most jerks love it when someone has taken enough interest in their work to ask questions. If you’re uncomfortable approaching someone you don’t know, reach out to your colleagues at the conference to see if anyone knows the speaker. And then, of course, e-mailing the question is always possible. Another good reason to write it down.